Hey everyone, Pi Day is coming up next Monday on 3/14/16, so be sure to pull out your favorite pie recipes in celebration! Actually, any occasion is a good occasion for pie, don't you agree? Of all the desserts that I like to make, pie is my favorite. 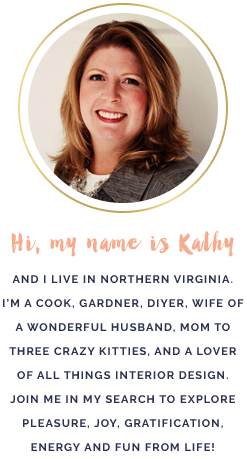 For some reason, it's one of those things that people really associate with home cooking, family and childhood, and it's one that most people indulge. Cake, not so much, but a homemade pie will get people's attention. Pie is also one of those things that people think is really hard to make, and it can be if you have to do everything all at once, but the truth is that it's one of the easiest desserts to make. In fact, the very first thing I learned how to bake was a pie. Yesterday, I whipped up a mess of pies in a baking frenzy. 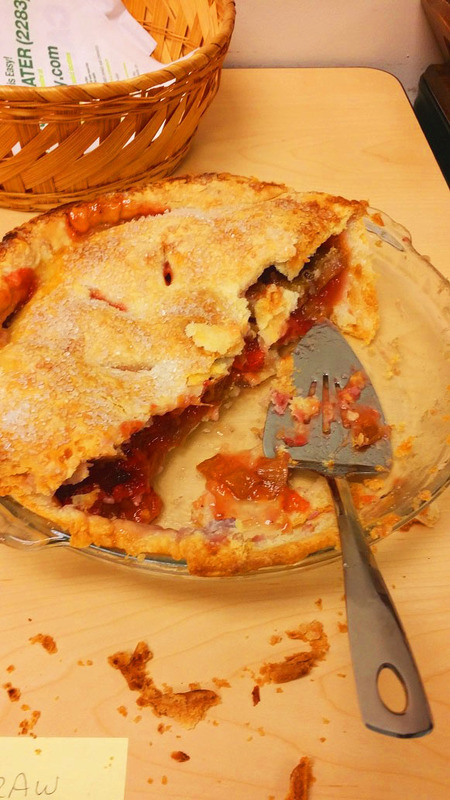 I had a freezer full of last year's fruit that I wanted to use and pie is a perfect vessel. 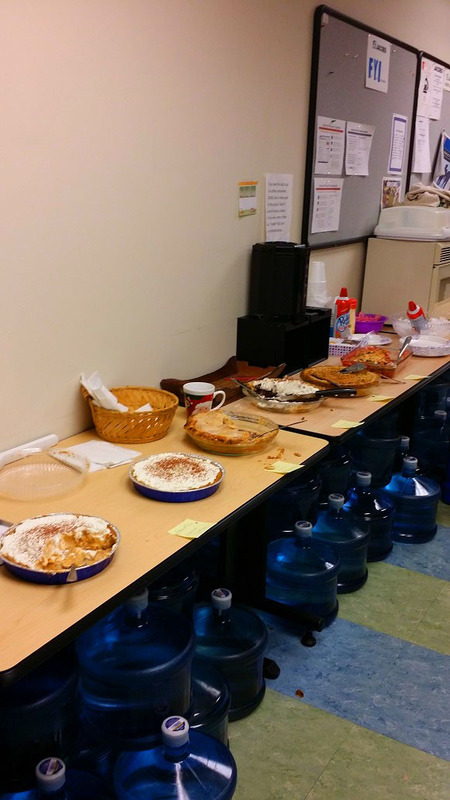 I made 5 pies and a dumpcake and brought them into my old workplace as a surprise. Most were new recipes, and two of them were unimpressive. That's the great thing about loving to bake and having people to share it with...you get to try out new recipes! First from the bottom left was the Banoffee Pie, which had promise, but it turned into a soupy mess. It's basically a graham cracker crust pie with a layer of dulche de leche, sliced bananas, and whipped cream. My take away from this is that it needs to be assembled JUST before serving and not allowed to sit overnight. 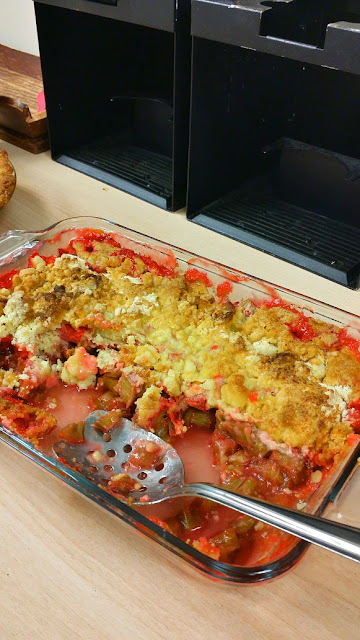 Next up was my pride and joy, Strawberry Rhubarb. I had researched about what would be the best thickener for this "juicy" pie and quick cooking tapioca was the winner. Yum! 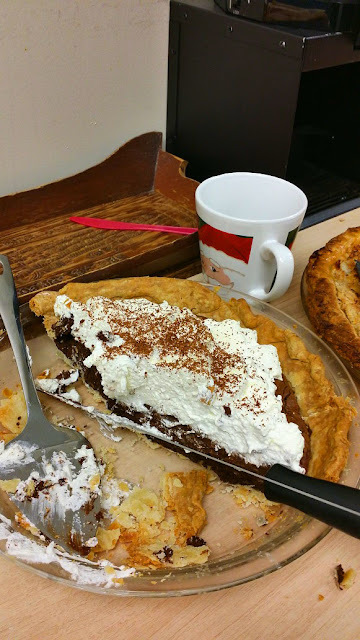 Next up was another new recipe, Chocolate Truffle Pie with Amaretto Cream. Let me tell you this pie was THE BOMB! I have to admit that I didn't expect it to be such a big hit, but in this pic the pie almost gone! 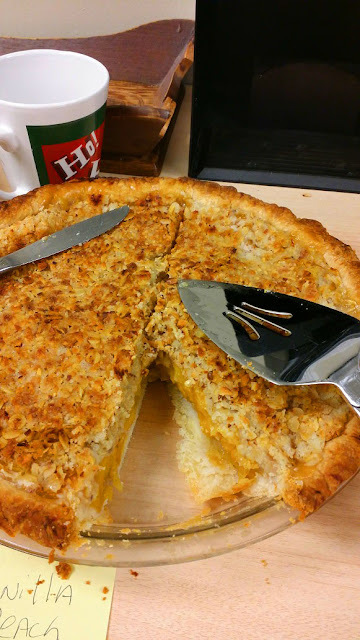 Next up was another disappointment, Vanilla Bean Peach Pie with Almond Oatmeal Streusel. 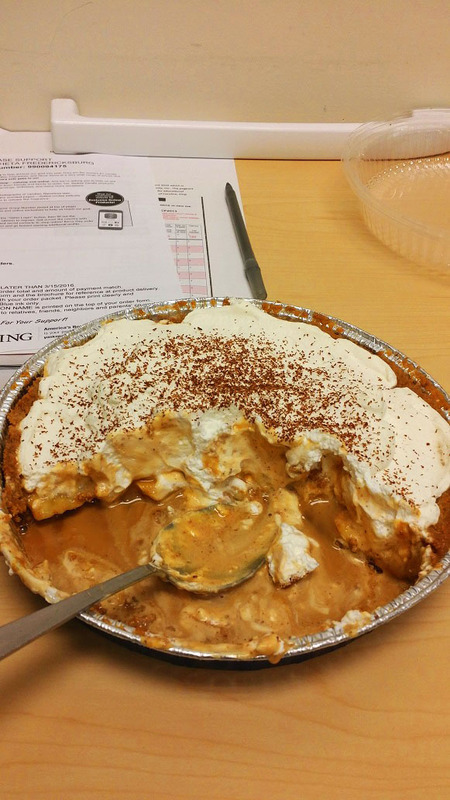 I used cornstarch for this pie and the filling was a little gluey and flat tasting. The peaches were previously fresh/frozen, so they didn't hold up very well after defrosting, plus the streusel topping was kinda boring. It was a pretty pie, though...I'm not including the recipe, it's not worth it. Lastly, not a pie, but another very pleasant surprise was a Strawberry Rhubarb Dump Cake. The most interesting thing about this is that it actually does not have any "real" strawberries in it at all, but instead strawberry jello! It was the easiest thing to throw together. I swear it tastes like the real thing and it went over wonderfully!